FedEx does it. Uber does it - optimize delivery routes with better software.How can campaigns up their game so canvassers spend less time walking and more time talking with people? The problem is hard, but it isn't new. Experts have been working on the traveling salesperson problem for years. 'What's the shortest possible loop that connects all the points in an area with the least time and effort?'. 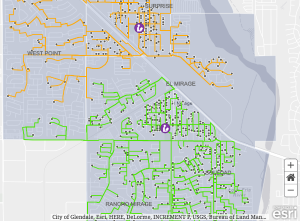 DemLabs teamed with ESRI on a pilot project to see how canvassers could reach more people with better walking routes. ESRI is a multi billion dollar firm that provides Geographical Information Systems (GIS) to most of the Fortune 500. It's software makes route planning a piece of cake. The people for the canvassers to contact are first chosen from the voter file and mapped. For this project, we chose low-income, progressive Hispanic voters in an Arizona district from the voter file. 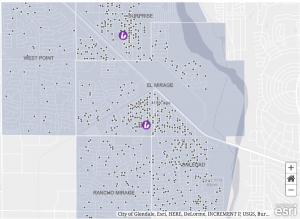 Two local libraries that serve as the starting points for the canvassers were also mapped. (The ESRI Plan Routes app can work with almost any address file). 2. Assign voters to canvassers. The workload is first divided evenly among the available canvassers. The software takes into account for how close houses are to the campaign's starting point(s) and geographical obstacles such as hills that canvassers may have to walk up. 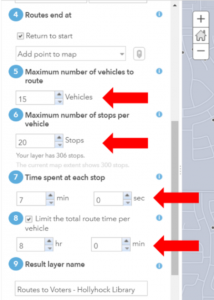 The app knows which houses are on the same side of the street, saving organizers time in route planning. Factors that the app should take into account are first defined. How many canvassers are available? Where will canvassers start and finish? How much time will they typically spend with each person? How long will the canvassers work in a shift? 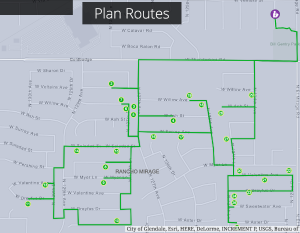 The Plan Routes app designs the most efficient route for each canvasser, taking all the factors into account. It can even suggest how many volunteers are needed to contact all the voters in a given period of time. Each canvasser gets a personalized walking map which they can access from their smartphone or tablet. The results of each interaction are entered into the app and uploaded to a central dashboard. The canvassing results can be integrated back to the original voter or address file. This project exemplifies DemLab's approach of applying commercial software to progressive campaigns. We niether develop nor sell software. The challenges faced by political and advocacy campaigns may appear unique, but often the technology to solve them have already been developed in the business sector. Best of all, these business apps are already tested, available immediately and cost a fraction of what it'd take to develop them from scratch. And they're continuously being refined, independent of election cycles! Let us know of a campaign need that could benefit from innovation, or good solutions that deserve more exposure. DemLabs is a small, lean non-profit with a highly scalable approach. Help us support more campaigns and evaluate more solutions by donating here. Thank you!